A Halloween display featuring a doll covered in fake blood being operated on by a surgeon with a bloody jack-o'-lantern head is causing alarm in Brooklyn. 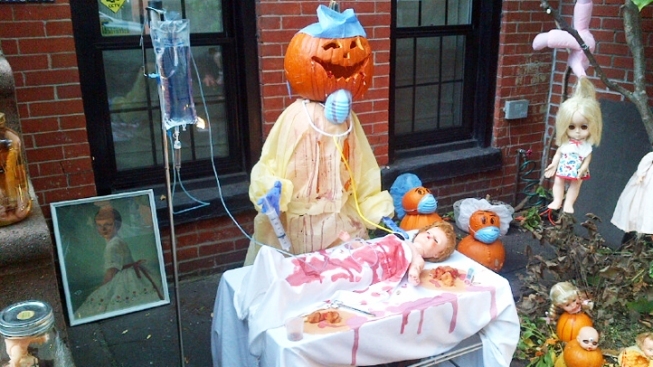 The display outside the home on Bergen Street between Bond and Nevins shows the doll on an operating table, hooked up to an IV, surrounded by pumpkins, dolls and doll heads, some wearing surgical masks. Dolls, some mutilated, also hang from a nearby tree. The grinning jack-o'-lantern surgeon, its bloody mask askew, holds a large syringe above the doll. "This is some sick, twisted-minded stuff," said Valerie Bell, who lives nearby. The homeowner, a documentary filmmaker, told the New York Post it was all in fun. “Every year the neighbors look forward to it. The kids say, ‘More gore! More blood!’ This is my neighborhood. I’m not going to hurt kids,” Joyce Draganosky told the Post.